Don’t get me wrong I am throughly enjoying this glorious British summer. However, when the rain started to fall this week a smile began to rise. Throughout the summer I have been craving wintery evenings on the sofa, cuddled under blankets whilst sampling a fine array of hot comfort food. 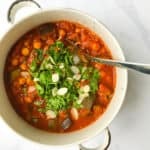 So when it poured down the other day, I did just that and boy did it feel good!This Moroccan chickpea stew was just what I needed. It’s hearty, it’s easy, it’s comforting but most importantly it’s BLOODY TASTY. This dish is the ultimate budget dinner. Chickpeas are so versatile and cheap – you probably even have a can sitting in your cupboard right now! This middle eastern legume is also incredibly good for you. Chickpeas are rich in plant-protein and fibre as well as being a source of iron, zinc and phosphorus. 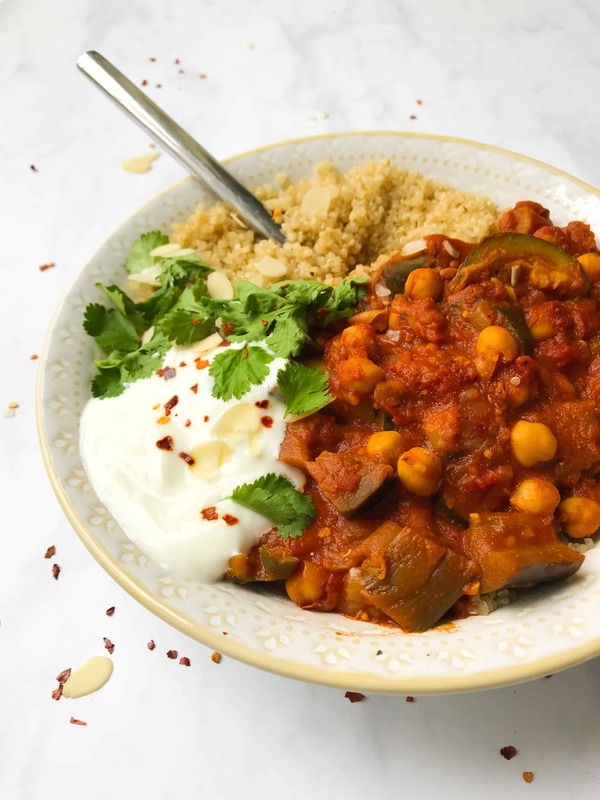 If you are new to plant-based foods but want to cut down your meat consumption, this Moroccan chickpea stew would be a great place to start. My mum used to cook meat stews for my sister and I when we were younger – they throwback found memories of family meals and togetherness. 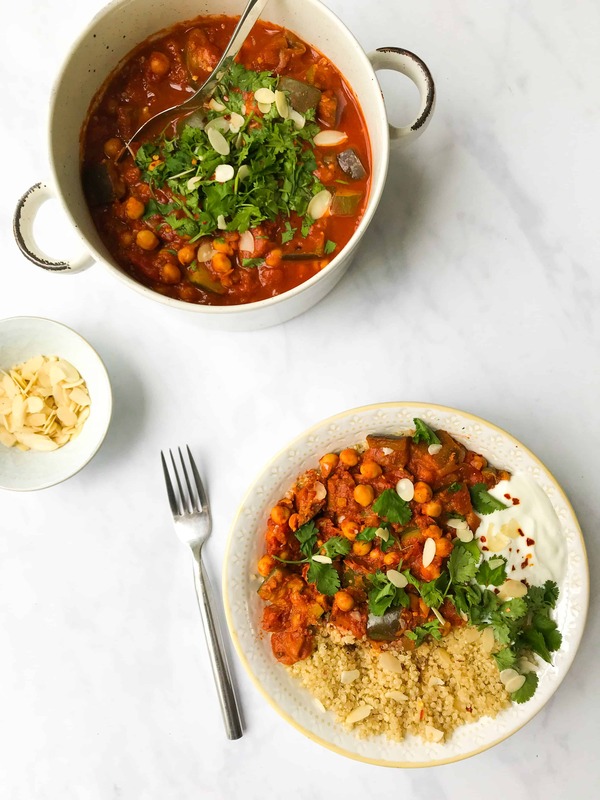 This Moroccan chickpea stew is meat free and may make you question its validity as an alternative main dish. But if I can sway the meat lover himself Mr Paul Mullen (Dad), who described the stew as “bloody tasty” and “better than what you could get in a restaurant”, then I think you guys are going to enjoy this. I really hope you try my Moroccan chickpea stew. 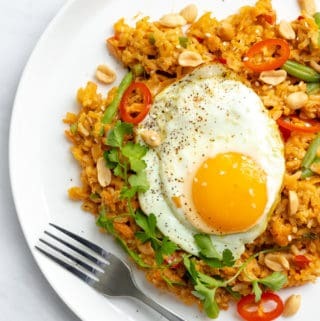 It’s a great recipe for feeding a crowd, or alternatively the perfect meal to cook on mass to be enjoyed over the week or left in the freezer for when you want something quick and easy. Be sure to let me know how it goes by tagging me on IG @georgieeatsuk, or leaving me a comment down below. Have a fab week guys! 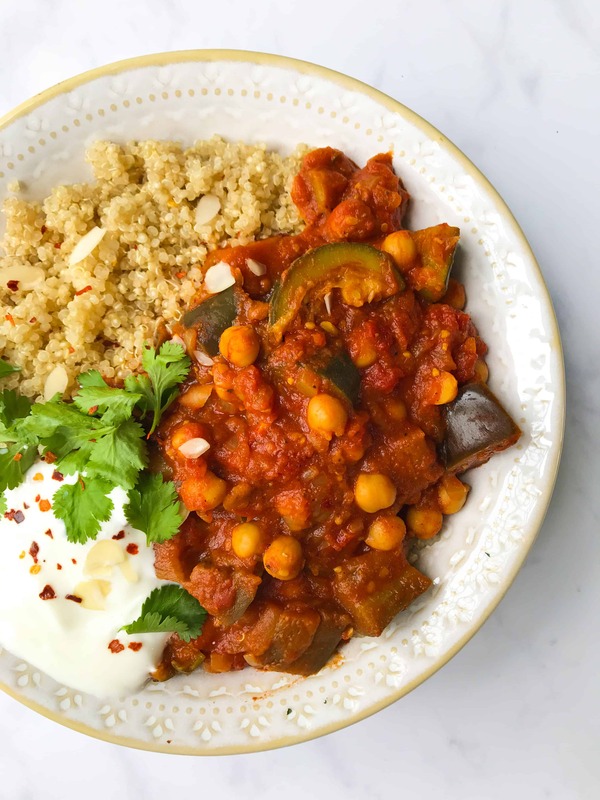 Tender courgette, aubergine and meaty chickpeas wrapped up in a beautifully spiced silk tomato sauce. 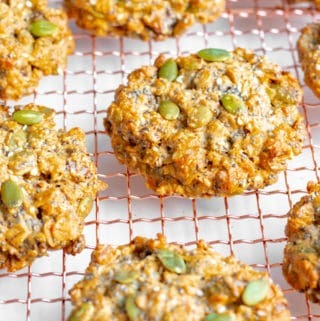 Perfect for feeding a crowd or to batch cook for busy days. 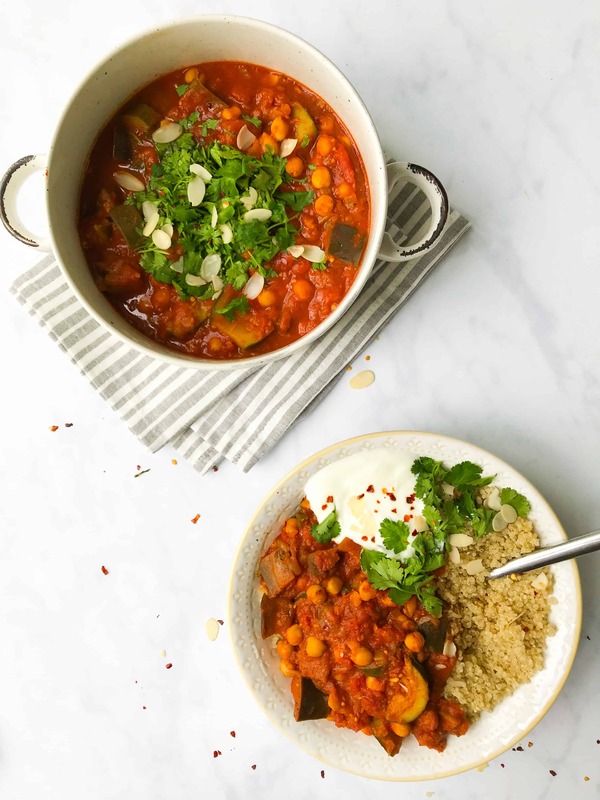 My moroccan chickpea stew will be your new favourite comfort food! Vegan, GF & healthy. In a large saucepan, heat the oil over a medium heat. Add the onion, salt and pepper then fry for 5 minutes until the onion has softened. Meanwhile, chop the courgette and aubergine into 1 inch chunks. Add these to the saucepan along with the garlic, ginger and spice mix. Stir well and cook for another 5 minutes or until the spices release their aromas. Add the vegetable stock, tomato puree, tinned tomatoes and chickpeas into the pan. Give everything a good stir and bring to the boil. Reduce the heat to low and allow the stew to simmer for 1 hour, stirring every so often, until the sauce is thick and the vegetables are tender. If you find that your sauce is too thick at any point during the simmering process add a splash of water in order to loosen. It should be shiny and thick but still have movement. Remove the stew from the heat, taste and adjust seasoning accordingly before serving whilst still piping hot. I personally love to serve this with a big bowl of quinoa or brown rice , splodge of natural yoghurt and a sprinkling of chilli flakes. It is also great over a jacket potato as a fancy alternative to beans. 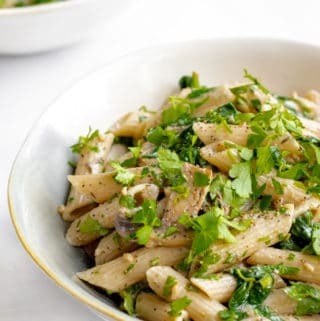 This is a great make ahead dish. 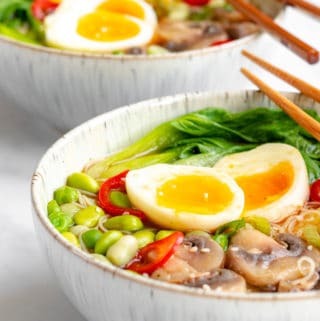 It keeps perfectly in the fridge for up to 5 days and tastes even better once reheated! To reheat simply warm the stew over the stove until piping hot. 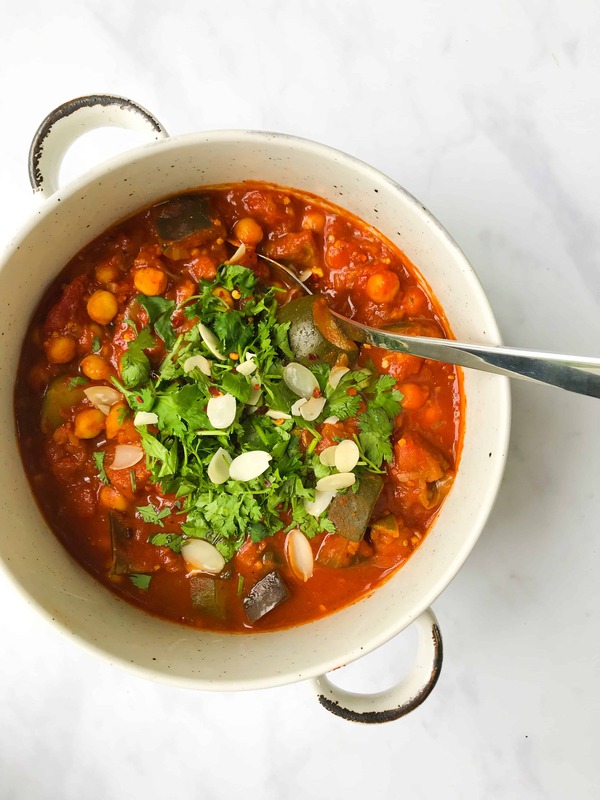 My moroccan chickpea stew also freezes fantastically for up to 3 months - just allow it to thaw completely in the fridge overnight before heating and serving. Make sure that you are using good quality vegetable stock that doesn't contain any added sugars or preservatives - I personally use the Kallo Very Low Salt Stock Cubes. I also like to add a whole stock cube to the 300ml of water even though they should normally be diluted in 500ml. If you aren't a courgette / aubergine fan, you can try changing up the vegetables to your favourites. Peppers or sweet potato work well. Try and stick to the spice mix as best you can but if you don't have one / two of them it's not the end of the world! Just substitute with a little more of the ones you do have. This stew sounds amazing. It would be so cozy once it’s fall!! i remember the first time i had cinnamon in a savory dish–it was a revelation! 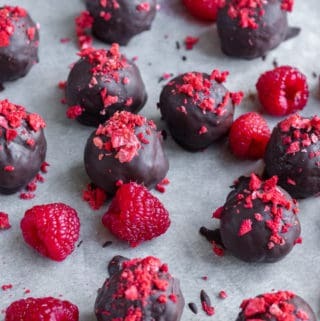 this makes my mouth water.